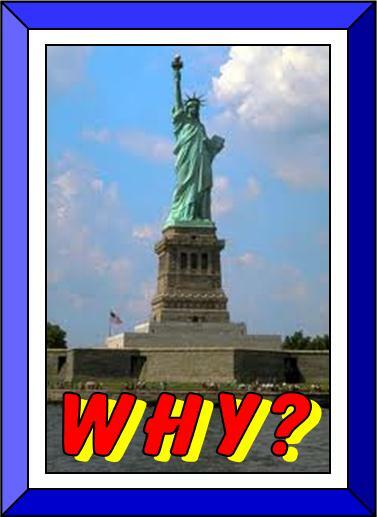 The Statue of Liberty stands 305 feet 1 inch or 93 metres in height from the base to the top of the torch. We see another example of such integrity in the work of MICHELANGELO in his four years labour (1508-12) in painting the very high ceiling of the Sistene Chapel. The painted area is about 40 m (131 ft) long by 13 m (43 ft) wide. 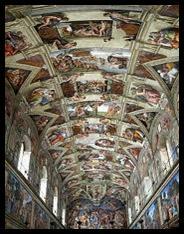 This means that he painted well over 5,000 square feet (460 m2) of frescoes, carefully perfecting the tiniest details of each figure he painted. because you know that your labour is not in vain in the Lord. I am Cloudwatcher, a 76 year old Christian lady, happily married to a wonderful man for over 50 years. We have five wonderful sons, all with at least one University degree and in top positions in their chosen fields. One son is still single but four have found perfect wives and they have given us five lovely grandchildren. I was born in England and while I'm proud of my English heritage, I am doubly proud to be a true-blue, fair-dinkum Aussie. My husband and I are committed Christians whose first priority is to love and serve our risen Saviour, the Lord Jesus Christ. My life story will tell of my journey from abuse to peace. I suffered 22 years of abuse, being constantly told I was totally evil and an ugly freak: no one would ever want me, so I might as well do the world a favour and kill myself. This entry was posted in Bible Truths, Devotionals, Inspiration and tagged attention to detail, Bible, Christian, Christianity, Cross, death, Faith, Father God, integrity, Jesus, life, personal, service. Bookmark the permalink. Wonderful illustrations, Angela. Thank you! For some reason “all or nothing” came to mind as I read … No one may ever see all I do, but the thought that I represent Him should be reason enough for me to give all, always. “All or nothing” is a good thought. I think of a friend who used to say “If a job’s worth doing, it is worth doing properly” Surely, in the service of the King of kings, nothing but our absolute BEST is good enough – in the little things as well as the big. What a tremendous privilege to represent Him here on earth – and what a responsibility! I think of that verse in 1 Corinthians often, Mentor Angela! It helps me so much to remember that nothing is done in vain, to not grow weary, to not worry if any one knows or sees. God bless you and I pray with you to be all He wants me to be, to do all that He wants me to do, no matter what. I think of that verse when I’m feeling lazy Deb, and I know that no amount of effort is ever wasted if done for Him and/or as unto Him. He always enables and empowers. Your posts are always motivational! Thank you so much and God bless you! Thanks Lyn. I give out as the Lord leads, so HE is the One who motivates. Amen! I feel you there! God bless you today, tomorrow, and always! DESIGNED FOR SAFETY: but can be dangerous! “I KNOW MY OWN” – What is my response? I MUST LOSE IN ORDER TO GAIN? WOULD YOUR ANSWER BE THE SAME? THREATENED BY A RAT – it could have changed the war! SWEET or SOUR? A fragrant perfume? "INLAND TSUNAMI" and a "WALL OF WATER"
AN EXCHANGED CROWN: amazing love! INNATE POWER - do you have it? use it? I sincerely thank my readers for all the awards I have received on this blog. I have made the decision to become an AWARD FREE BLOG for two reasons. Firstly, my time here is limited and I prefer to spend that time writing posts, reading others’ posts and responding in comments. Secondly, as a blood-bought, adopted child of the living God, my aim here is to exalt the Lord Jesus Christ and testify of the reality of His blessings. I write as He directs and all glory is due to Him.